I really wish Balenciaga’s creative director Demna Gvasalia didn’t do this. This is ugly and uglier than UGGS. 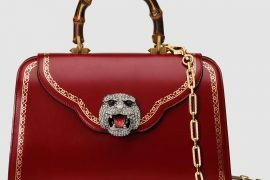 Anyway, this is one of the items fashion house unveiled yesterday during their Paris Fashion Week Spring/Summer 2018 show. Crocs and Balenciaga worked together to bring these high-heeled platforms to the luxury fashion world. 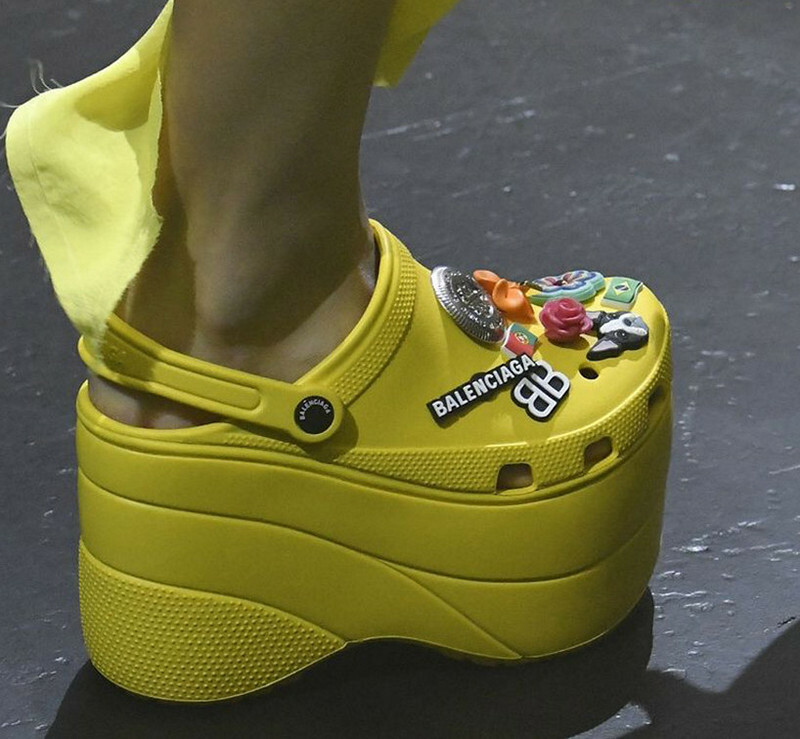 Not sure if these Balenciaga Foam Crocs going to end up in hospital surgery rooms though. The good news – this is a limited edition collection. The 4-inch (10cm) platforms in colors yellow, pink, light green and many other colors offer plenty of customization in the form of plastic Jibbitz (shoe charms) to snap-on to crocs and decorate them. 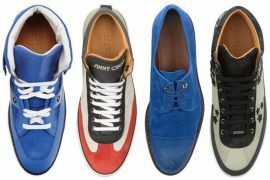 Demna surely hoping this is a matching shoe to their $2,145 Extra Large Tote that if you remember looked a lot like 99 cent Ikea blue bag. 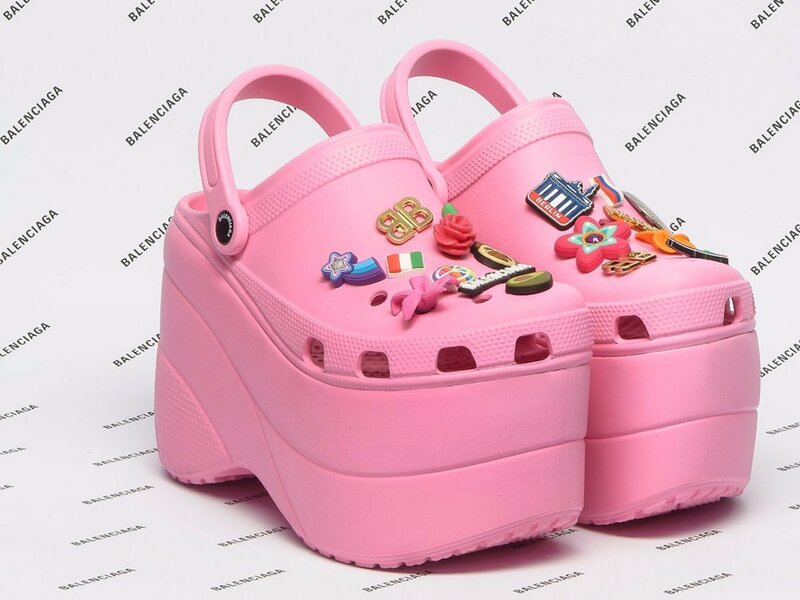 Gvasalia said, “it’s light, and in the future, you will be able to 3D print them at home because they are all one piece – we are using a one-piece foam mould, and working with these kind of materials is very Balenciaga!” The Balenciaga Foam Crocs will also be branded with Demna’s newly redesigned Balenciaga logo, which is a visually shortened logo in a bold font. Those who wear Crocs (read – hospital staff) swear by its comfort and podiatrists by their medical benefits. Made from a foam resin called “Croslite”, they have the ability to form itself to wearer’s feet. No word on price, be ready to pay few hundred bucks.